Ikki Sushi is located on Kingston Road, between Danforth Avenue and Midland Avenue, in car-country Scarborough Please read our conversational review, below. 7.0 / 10Sure the place and area look a bit sketchy but the food is anything but. 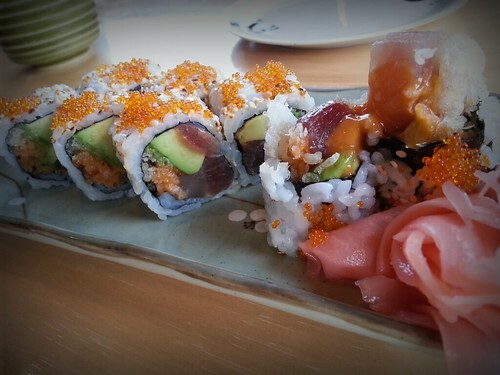 What you’ll find is a decent neighbourhood sushi joint. 7.5 / 10Don’t get spooked by scary parking lot — the food is decent and they’ll treat you well! 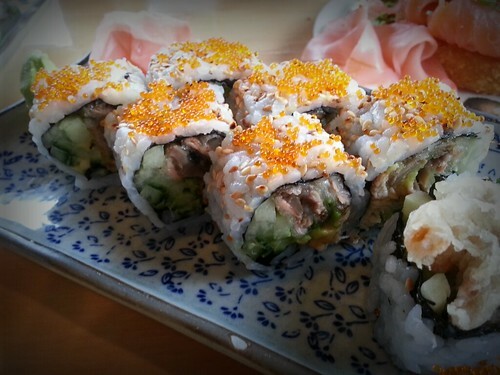 Here’s something different: The Sushi Toronto duo decided to have sushi out in Scarborough. 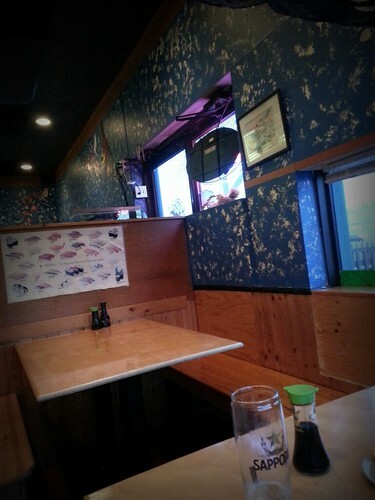 The first thought was Zen Japanese Restaurant but apparently you require a reservation there on a busy Tuesday night! 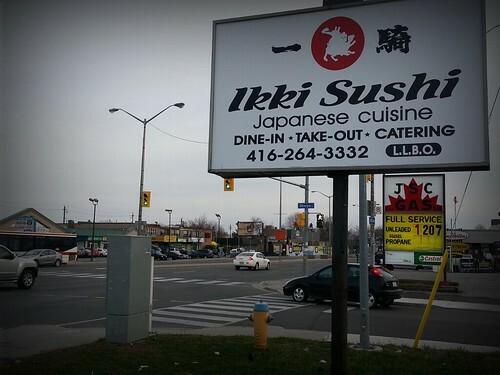 So, off to Ikki Sushi near Kingston Road and Midland. Upon pulling up, the outside of the restaurant and parking lot looked pretty sketch, but things improved once we peeked inside. Ha the Zen restaurant intrigues me even more now so I guess we have a place to go next time… and we’ll make a reservation for sure! 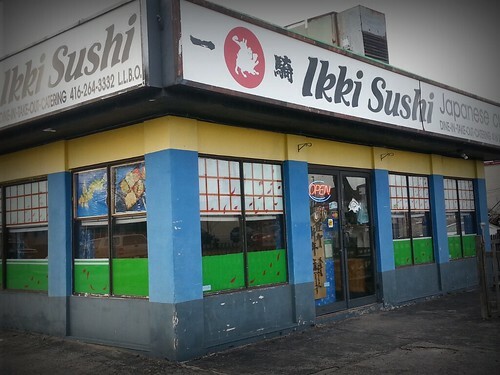 As for Ikki, I drive by this place all the time and it does give off a sketchy vibe. A fresh coat of paint could do wonders in my opinion. It’s small and cozy inside and a lot more welcoming. There were a a few people already but wasn’t too busy and was easy to find a booth to sit in. Oh, back to the outside real quick. There’s a sign that says “John Anderson Customers Only. Unauthorized parked vehicles will be tagged and/or towed away at owners’ expense.” Soooooo, I guess if you use the parking lot, you could be ‘tagged and/or towed”. Ok, so back inside: We were greeted right away and then chose a seat. Menus were in front of us in no time. 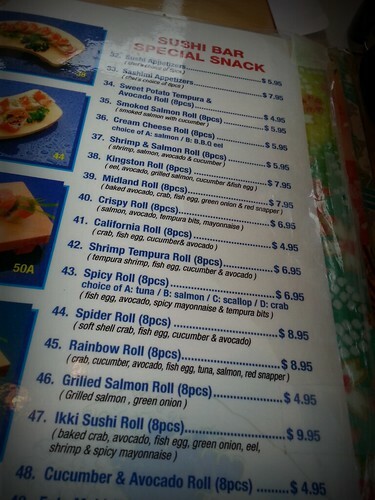 They were the typical colourful, laminated menus that a lot of sushi places employ. Yeah the menus were a little beat up but had lots of pictures. 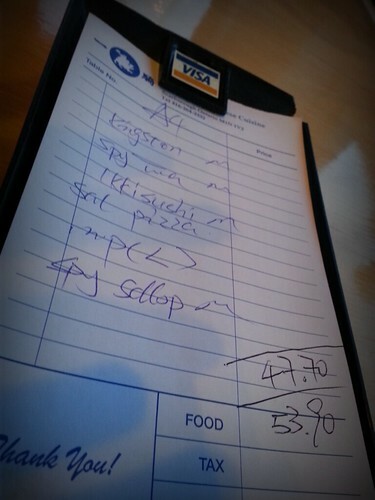 It’s a pretty typical Toronto Sushi type menu with the usual stuff like sushi pizza (tuna, salmon or eel!) 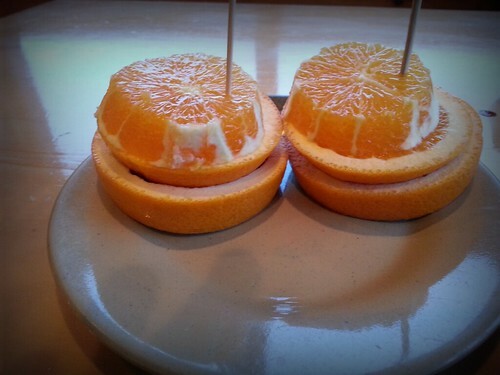 along with some aptly named specialty rolls like their own Ikki, Kingston and the Midland Rolls. If you’ve read any of our reviews before you already know that we’ll be getting the Ikki Rolls. We don’t even have to even find out what’s in it. Indeed, We DID order the Ikki roll (baked crab, avocado, fish egg, green onion, eel, shrimp and spicy mayo) along with the Kingston roll (eel, avocado, grilled salmon, cucumber, and fish egg), Spicy Tuna roll, and the Salmon Sushi Pizza. We had them in front of us in no time. Yeah it was nice as they all came out one after the other. There weren’t too many people dining in but I did notice a steady stream of people coming in for take out orders throughout the time we were there. The rolls were pretty good. The spicy tuna rolls were done a bit differently as they weren’t too spicy but there were bigger chunks of tuna than I’ve seen before. Yes, agreed, not ‘too’ spicy. I could have probably had a bit more kick, but I enjoyed them. 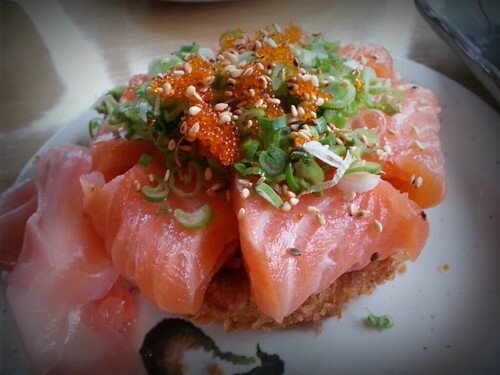 The Salmon Sushi pizza was ‘ok’, but I may be souring on sushi pizzas overall now. Not sure. The presentation was nice, however. Ikki Roll maybe had a bit too much sauce on it but other than that I thought the Kingston rolls were pretty tasty. 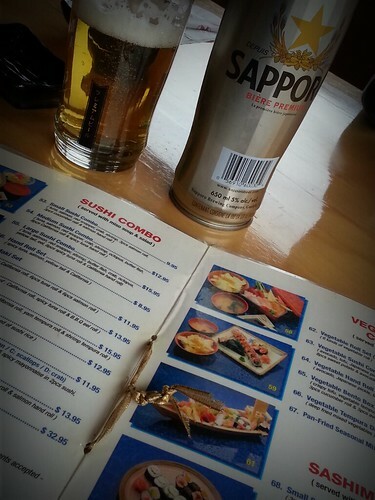 Would have liked to try some sushi or sashimi but today was a roll day. We’ll probably save that for our trip to Zen next time around. I actually enjoyed all the rolls — which I wasn’t expecting when we pulled up in the parking lot!? The Ikki was the worst of the bunch for sure. It was ‘alright’. The rest I quite enjoyed. 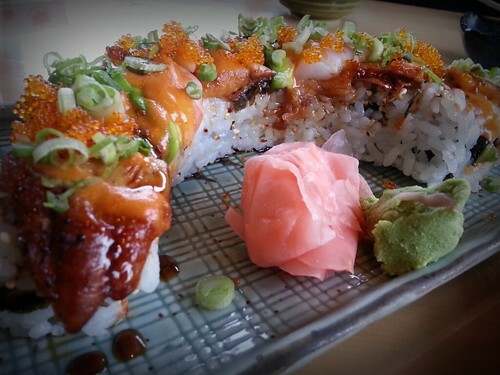 After we finished those off we capped the meal with one more order — the Spicy Scallop roll. 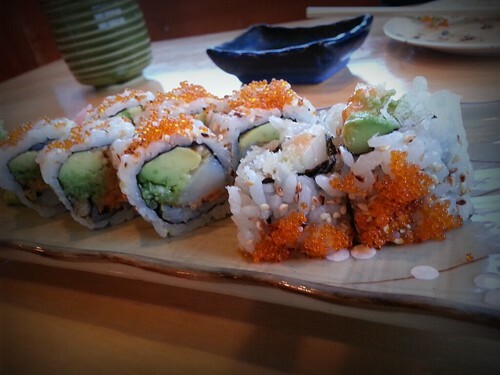 I’d put that one on par w/ the other spicy roll we had – it was quite good. 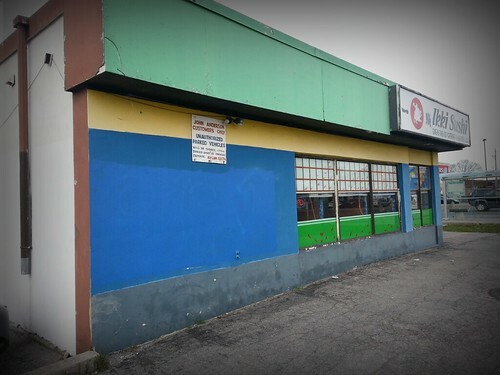 Just to let you know, Ikki Sushi has moved to the south side of Kingston Road into a nice clean building with a decent parking lot. The ambiance is much improved!